I’m approaching the end of 9 months of blogging at This Online World, and I think my motivation to blog and create content is at an all-time high. It can be easy to lose motivation when embarking on large projects…especially when there is a wealth of information out there that makes said project seem like a walk in the park (I’m looking at you, ‘how to make money’ blogging courses). However, publishing monthly income reports and setting some realistic goals have helped to keep things on track, and I’m very excited for the months to come. There are plenty of articles I want to write, and I’m looking forward to growing even more. Before getting into the details of this income report, I just wanted to say a quick thank you to everyone who has continued to read my blog. Blogging is a hobby of mine, but I truly get a lot of satisfaction and enjoyment from sharing my writing, and friendly emails, questions, and comments really make my day. Now, let’s get into the income report! Once again, I’m going to start writing my income reports with the income section at the start since that is what people care most about. All in all, This Online World earned $254.62 for the month of September. Google AdSense Revenue – $121.71. 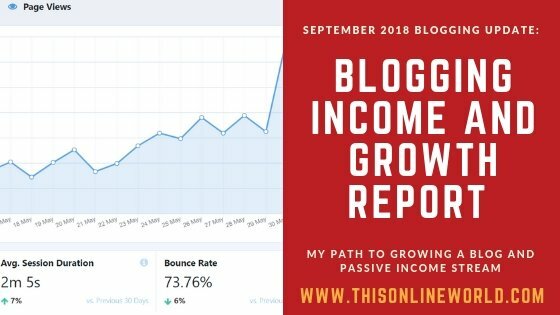 In my previous income report for August, Google AdSense generated the majority of blogging related revenue, and earned $166.17. I was afraid the RPMs from August were an anomaly, and to an extent, they were. However, even with slightly lower RPMs and fewer clicks, Google AdSense still earned more than $100 in a single month and that is more than sufficient for me! I’ve also added another AdSense ad unit to my blog, and after reading this AdSense optimization guide, I’ve decided to slowly run my own A/B tests and occasionally switch things up to examine the impact on revenue/RPMs. I am still eager to apply for Mediavine once I reach 25,000 sessions, but I think there is still a lot of value to be found by tinkering with other advertisement networks. For other bloggers out there, don’t be afraid to mix things up periodically for the sake of data and testing! 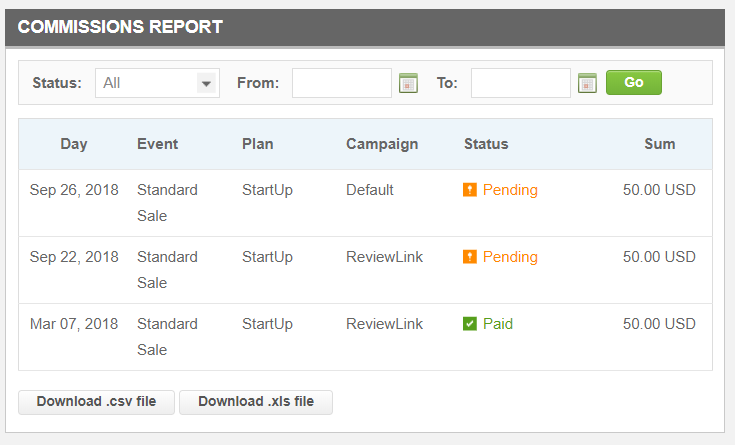 SiteGround Affiliate Sales Revenue – $100. I was definitely surprised when I got an email from SiteGround in late September that informed me someone had used my affiliate link to sign up for web hosting. Earning $100 from referring people to start their own blog with SiteGround was a great aspect of blogging in September. I think the whole ‘blogging about blogging’ niche has developed a justifiably negative reputation as bloggers are increasingly lying or misleading people about the lucrative nature of starting their own blog to benefit from affiliate sales. However, this month, my post on the road to a $100/month blog was the greatest driver of traffic to my SiteGround affiliate links. To me, I’m really happy to see that an honest post that doesn’t exaggerate the realities of making money with a blog can still encourage people to start their own blogs (blogging is hard work, but it is incredibly rewarding). I started this blog with the purpose of remaining transparent and teaching other people to make money online while making money with my own experiments. I’m just glad that this missions seems to be working out! How to Start a Successful Blog – A Guide to Blogging as a Beginner. 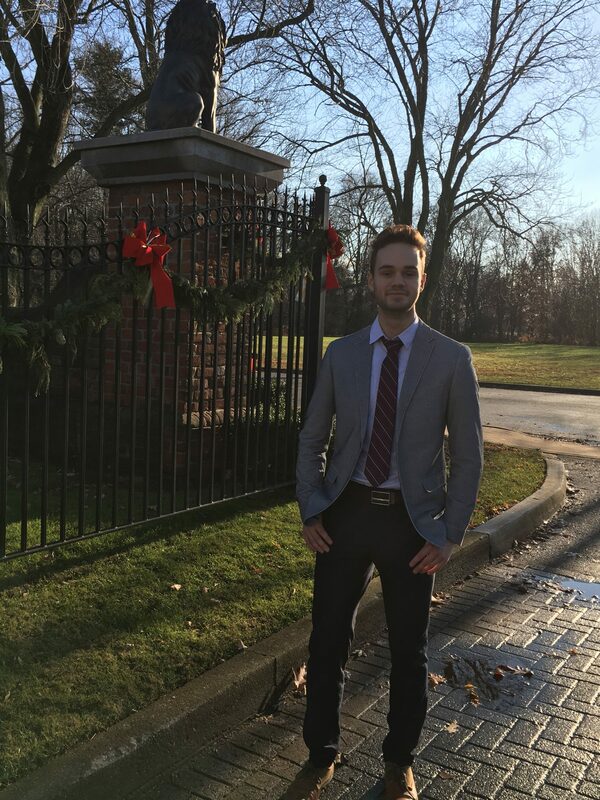 Why I Chose SiteGround Hosting. Medium Content Syndication & Amazon Affiliate Sales: – $32.91. While my Medium revenue has slowed down and the Amazon Affiliate Program has never resulted in a lot of income, they still contribute to my monthly blogging income without any work and are useful programs for other bloggers. I plan on making 2019 a strong year for making money on Medium, and this month, I also published a post on recent Medium Partner Program updates and tips on writing on the platform. 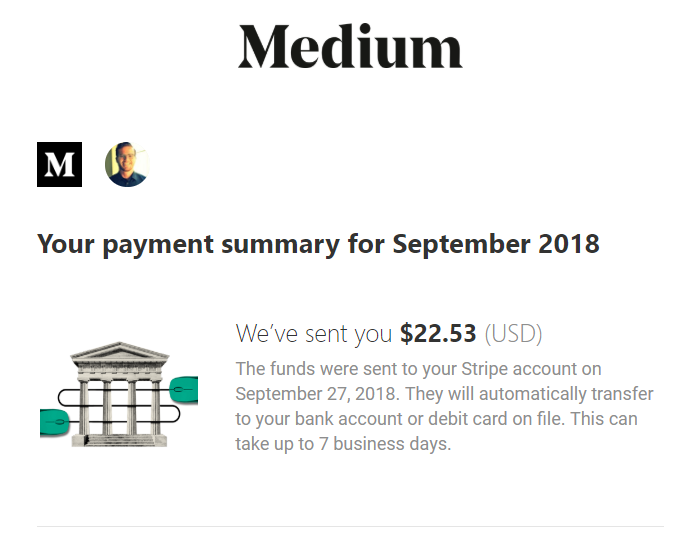 This month, my Medium content earned $22.53. Amazon Affiliate links also earned $10.38. Not bad for bits of passive income! If you’re a blogger who is struggling to earn income, I think peppering in Amazon Affiliate links (for products you actually use or recommend) and syndicating your content on Medium are handy low-hanging fruits in the income department! I’m probably going to omit my phone farm earnings or income from my digital marketing side hustle, KB Consulting, because they aren’t purely blog related. However, there are other affiliate opportunities or ways to make money online out there, and I plan to explore these even further in the coming months. In particular, I’m going to start looking for more affiliate programs or revenue streams that also benefit other bloggers or readers. For example, recently I joined the Media.net Ambassador Program, which allows me to promote Media.net, the world’s second largest contextual advertising network. When people signup for Media.net with my link, they will earn a %10 bonus on their earnings for the next 3 months, and I’ll earn 10% of their earnings (from Media.net’s share) for 12 months. I used Media.net ads on this blog in the past, and I’m just happy to find an affiliate program that can be mutually beneficial. Over the next few months, I plan to explore additional revenue generation ideas that can help out readers as well. I think this will help increase monthly blog earnings, and it might also help other beginner bloggers or readers with some aspect of finance or earning money! While my blogging traffic didn’t increase substantially in September, this month still showed promising signs of growth. I’m still working towards the 25,000 session mark, but any growth is good growth! Additionally, I also had the highest single day of traffic since I started blogging after I shared my post on gig economy apps on Hacker News. Almost 1,200 sessions in a single day from Hacker News! For those of you who don’t know, Hacker News is essentially a news syndication website that focuses on technology and business. Hacker News was founded in 2007, and the website receives an impressive amount of monthly traffic. My friend Peter Koch from Seller At Heart recommended Hacker News to me a few months ago, and I have sparingly shared content that matches the interests of the platform since then. For other bloggers who are in the tech or entrepreneurial space, sharing your content on Hacker News might be a great way to increase your monthly traffic and gain some exposure. I am still a firm believer that developing organic traffic by creating great content and researching keywords is the most valuable way a blogger can spend their time. However, it’s also important to diversify one’s traffic to keep the proverbial eggs in multiple baskets. After all, a single Google update or algorithm change can significantly impact organic traffic at unexpected times. While I haven’t figured out how to generate substantial traffic from any platform other than Quora, I’m going to keep on persevering on Pinterest to get closer to the 25,000 session mark. Hopefully, time + long form content + backlinks will be the magic formula to get there! That’s all for this income report this month! I plan on releasing some more side hustle related posts for the month of October, so hopefully you guys will enjoy the new money making ideas! If you want to check out past income reports, they can be found here. Hi Tom! Thanks so much for the shoutout. We would love to have you join us at Mediavine. As you mentioned, our threshold is 25k sessions within a 30 day period, which you’ll quickly reach if you keep up the awesome work! I came from giorgiogd.com’s post. It’s inspiring to see how you are progressing. 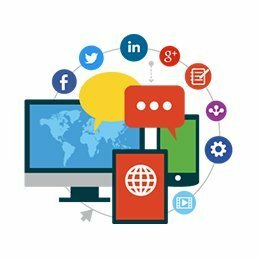 You mentioned in giorgiogd.com’s post that you are doing backlinks which helps with SEO. Do you by any chance have a blog post where you share tips on getting backlinks? I noticed you received a lot of backlinks in just a few months, it’s amazing. Great income report! You are doing great for 9 months!